Makenzie is SITTING so well!! Since Makenzie accident life has been a whirlwind. I am not just talking about the tasks, chores, and extra responsibility. I am also talking about the continuous battle of the wills between God, myself, and human emotion. I pride myself on being an advocate for Makenzie. I am the momma bear! We have done a lot with Makenzie in the last couple of years. She receives a lot of in home and clinic therapy. She also has most all of the equipment that she needs and I have taken her to do many "out of the box" treatment options. None of this has come with out much time, money, sweat, and tears! What I wanted to say tonight, is something I do not share enough with all of you most of the time. I am not the one in charge of any of it! I am at peace and know that God is in control! Everything that we have done for Makenzie I feel I have done with God's blessing. 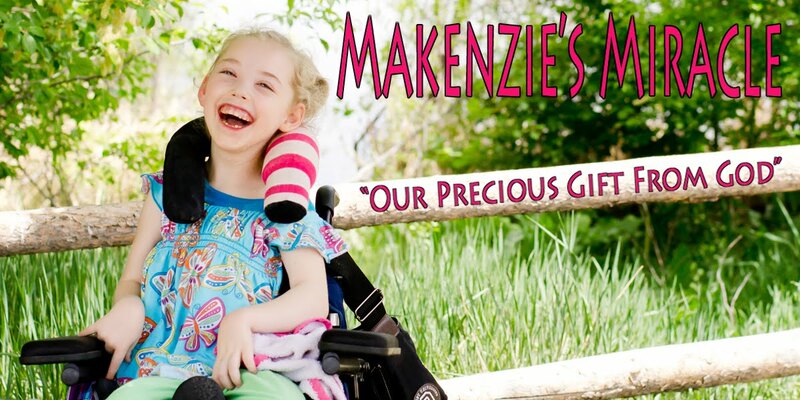 Every piece of the puzzle that lead up to Makenzie's accident was ordained by God! When I think back to the 18 months before March 25th I am AMAZED! First the 5 years we did foster care. I took care of 2 kiddos that needed Child Find Evals, had IEP's, and medicaid. I was able to learn a ton about navigating the government systems long before I ever needed them for my own child! WHY? Only God knew! Then one week before Makenzie was born I started watching a beautiful little girl with CP. However, at the time I began watching her she had yet to be diognosed. I got to once again walk through the Child find process, IEP process, EI, and preschool. I also got tons of knowledge on botox, doctor hot socks.. as she call the orthopedic doctor, AFO's phenol, clinic therapy, and the rehab department. This precious little girl also lead me to the therapist that is now known as Makenzie's PT!!!!! WOW!! This therapist came to my home 1 time a week for 18 months to treat the little girl I was babysitting. She met Makenzie when she was only 1 week old! P. watched her learn to roll, sit, crawl, walk, and talk! After Makenzie's accident when I first realized that she was not OK I called her crying. She came down to the hospital and rubbed Makenzie out, offered her constant support and has been working with Makenzie ever since! Truly the hand of God!! Two of Makenzie's most special gifts from God! She LOVES then SOOOOO much!!! I also met another mom at my church that I became good friend with and guess what.... she also had a little girl with CP! She was able to walk with me through the beginning of this journey. She helped me with SSI, meals, most importantly friendship! Over the past year we have lost touch and I miss her friendship dearly! There is several other ah ha moments but I think you get the point! I still struggle with giving Makenzie fully to God! I give her to Him every day but it doesn't take long before I take her back! I do trust God's plan! I know that He is there and he knows what is best! Now I need to learn to give Makenzie completely to him for good! The answer is I don't do it! It is through the Grace of God I make it through each day! It is through him and because of Him, through all of you, we have been able to provide Makenzie with all of the services she has received. ANY and ALL healing is not because of my effort, research, time invested or money but is God's perfect handiwork! He is working through me and to God I give ALL the GLORY!!! Pray for this Momma Bear to be able to FULLY surrender all of Makenzie to God! He is the true healer and he really doesn't need me at all but I feel so blessed that he HAS chosen me to be Makenzie's mommy.